Hormones are small chemicals which can be secreted by different glands and tissues within the body. They travel through the circulatory system to reach other target tissues causing a variety of effects, such as growth hormone triggering muscular tissue to grow and repair. Some hormones even cause other tissues to release hormones. We call this a ‘cascade’ effect. Even though hormones travel through the blood, they don’t have an effect on every tissue they come in contact with. Hormones are like keys that target specific cells which act as locks. The hormone adrenocorticotropic (ACTH) will only have an effect on the adrenal gland. Let’s begin from the top. The part of the brain called the hypothalamus acts like a thermostat in your body. It will monitor the levels of chemicals in your blood and even the temperature of the body. It is connected to the pituitary gland, a small oval shaped gland situated in a protective fossa of the sphenoid bone. 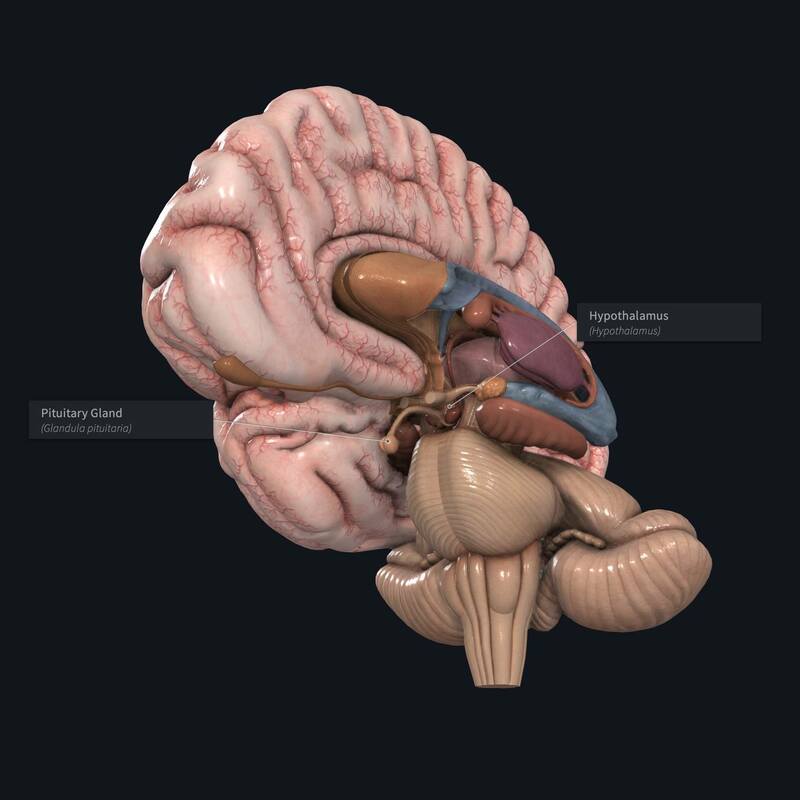 The pituitary gland is often called the ‘master gland’, because it releases 9 very important hormones which help regulate endocrine glands around the entire body. If your body temperature is too low, the hypothalamus will release a hormone called Thyroid-releasing hormone. This will travel through a specialised circulatory portal system to reach the pituitary gland, which will respond by releasing thyroid-stimulating hormone from the anterior lobe. This hormone cascade continues as the TSH floods the circulatory system and reaches the thyroid gland, where it will have an effect due to the lock and key principle. The TSH causes the thyroid gland to release Thyroid hormone, which increases basal metabolic activity, thus increasing the body’s temperature. If the temperature gets too high, the hypothalamus will detect this and begin to inhibit the release of thyroid-releasing hormone. This is known as a negative feedback loop. So now it’s clear how hormones are tightly regulated to help maintain homeostasis within the body.